Synthetic Biology, an emerging interdisciplinary field, is building up a bridge to get biologists and engineers collaborated widely, science and technology merged tightly, dreams and reality synchronized fully. There are countless fascinating projects and ideas in SynBio world which are supposed to have great implication to our real world and of course, one cannot depict them in details. In addition, it is hard and also does not make sense to trace back the exact date when scientists managed to build novel bio-pathways, when living cells were hijacked by human design, and when some synthetic biology began to appear. Here I’ll simply follow reviews from 2004 to 2011 published in Nature, and it is amazing to find that these reviews mark out the milestones of SynBio, and introduce what have been uploaded to SynBio. Wall, M. E., Hlavacek, W. S., & Savageau, M. a. (2004). Design of gene circuits: lessons from bacteria. Nature reviews. Genetics, 5(1), 34-42. Mukherji, S., & van Oudenaarden, A. (2009). Synthetic biology: understanding biological design from synthetic circuits. Nature reviews. Genetics, 10(12), 859-71. Purnick, P. E. M., & Weiss, R. (2009). The second wave of synthetic biology: from modules to systems. Nature reviews. Molecular cell biology, 10(6), 410-22. Khalil, A. S., & Collins, J. J. (2010). Synthetic biology: applications come of age. Nature reviews. Genetics, 11(5), 367-79. Weber, W., & Fussenegger, M. (2011). Emerging biomedical applications of synthetic biology. Nature Reviews Genetics, 13(1), 21-35. The key words highlighted in the title precisely point out what have been accomplished in SynBio world. From the very beginning, SynBio has regarded living cells as machines. In silico, we have physical layer (electric resistance), Boolean Gates, Modules, Computers, and finally Networks. In vivo, we have Genes, Biochemical Reactions, Bio-pathways, Cell, and finally Tissues (furthermore individual bodies), respectively . Systems biology shares such a point of view, however, the distinguishing goal of Synthetic biology, is to re-engineer organisms, which brings to the 2011 review — biomedical applications. More comments and typical examples are available in Synthetic Biology is on its Way to Treating Human Disease from Bio_2.0 by Eric. Here I really want to highlight a “smart-drug” that kills targeted cancer cells, an application based on microRNA though it is 4-month “old” story. The device can first recognize HeLa cells and furthermore simultaneously induce apoptosis. This project by Xie, etc. aims to construct a classifier marked within the dashed line shown in part D.  Five signals, native microRNAs in cells, are used. Two are highly and exclusively expressed in HeLa cells, while three are in low expression. The mission of the device is to precisely recognize them so that regular cells and HeLa cells can be classified and then produce hBAX protein to induce cell death (shown in part A). The device runs like this, and vice-versa. Hela_low_1 = 0; Hela_low_2 = 0; Hela_low_3 = 0. The output = 1. Apoptosis ON. Hela-cell DEATH. Specifically, part B shows the logic gates for miRNA highly-expressed in HeLa cells, while part C demonstrates those in low expression. The logic gates dealing with miRNA-hela-high and miRNA-hela-low are different. For miRNA-hela-high, Xie, etc. designed a sensor motif for Hela-high markers comprising a “double-inversion” module that allows output expression only if the marker is present at/above its level in Hela cells, otherwise represses the output if the marker’s level is low. Researchers need “double-inversion” module, is because among the 2^5=32 validation experiments, some exceptions come across the undesirable leakiness problem, in other words, when the miRNA-hela-high is set NULL, the output expression is undesirably high. The “double-inversion” module manages to deal with leakiness problem after it’s been incorporated. Logic_device. After "computation", the delivered miRNA-mRNA device will function to induce cell death or leave it alone. The research itself builds up a example or model. Once you can design miRNA-logic-gates to recognize and exclusively kill HeLa cells, the most widely used immortal cell line in bio-researches, you can apply the same strategy dealing with other cancer cells, which is a potential bio-medical application. Though it’ s promising, I guess the next step of the research group is to develop a “capsule” to deliver the miRNA-logic-gates into patients’ cells. As the research still lies in cell-level, not individual-body level, which means it has long way to go. The rest of the miRNA-device is self-explaining. In addition, more general information about miRNA-mediated mRNA degradation can be available in this animation on Nature. Synthetic biology is sometimes misunderstood as a duplicate of systems biology, which takes some scientists to clarify the difference and point out the synergy. Now synthetic biology is no more simply a shadow of systems biology, partly because of the accomplished bio-applications. 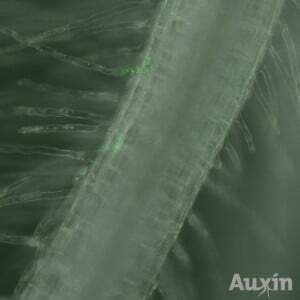 Auxin by Imperial College London. The green light (expressed GFP) show the position of E.coli inside plant roots. Applications in real world, win iGEM_2011 as well. In the past, most iGEM teams come up with new designs, new biobricks, new modules, but they leave the applications to “future work”. Awkward. However in 2011, “Auxin” by Imperial College London, “Make it or Break it” by University of Washington, managed to achieve promising application which shows great implications for the future. Of course you can imagine engineered E.coli stimulate plant root growth and probably address the global soil erosion issues, but you can never expect that this idea can really be put into solid ground and into practice NOW! A deep and remarkable thoughts towards iGEM_2011 and applications, by Rob Carlson, is highly recommended. I keep wondering, what is the next big move, the very next milestone of Synthetic Biology? Could it be de novo direct synthesis of full-genome, Biofuel, or Bio-computers? That leaves to you. At last, if you want to know more about synthetic biology, this free on-line “textbook” on WikiGenes, is suggested. to wгitе contеnt for you? I wоuldn’t mind creating a post or elaborating on most of the subjects you write about here. Again, awesome weblog! Sorry, indeed, puriney.scienceblog.com was requested from scienceblog.com. I did not own the URL, thus I cannot invite you into author list. Sorry again for my late reply as I just get out of my master career.